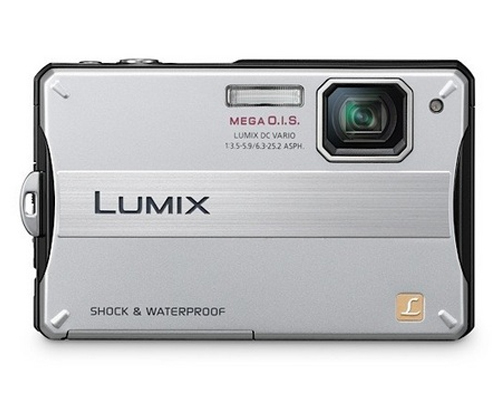 The Panasonic Lumix DMC-TS10 is a rugged 14.1 megapixel digital camera that offers quad-protection. The camera is waterproof, shockproof, dustproof, and freezeproof, perfect for the rugged adventurer to record his escapades and not miss a thing. The stylish yet rugged Panasonic DMC-TS10 weighs only 172 g or 0.38 lb including battery and memory card and measures 3.95” in width 2.5” in height and 0.85” in depth. The flat and slim design incorporates style with roughness; the camera can withstand depths of up to 10 ft or 3 m and be able to shoot great images underwater. The DMC-TS10 is also shockproof; it is able to survive drops from a height of 5 ft or 1.5 m. In winter, using this camera will not create problems since it is freezeproof, all components will perfectly up to temperatures of -10 degrees Celsius. Finally, the DMC-TS10 is dustproof making it an efficient camera when going outdoors for hiking or camping. The Panasonic Lumix DMC-TS10 digital camera is equipped with a 1/2.33-inch CCD image sensor with a resolution of 14 megapixels allowing you to enlarge your photos without losing detail. The Lumix DC Vario 4x optical zoom lens with Folded Optics Technology and a focal length equivalent of 35 mm to 140 mm is capable of taking clear shots even from afar. The lens for the DMC-TS10 has aperture values of F/3.5 to 5.9 and a minimum focus range of 1.64 ft, macro mode can get closer to 10 cm of the subject. The Venus IV image processing engine of the Panasonic Lumix DMC-TS10 permits beautiful and stunning images even in high sensitivities. The Venus IV engine makes other functions such as the MEGA O.I.S. or MEGA Optical Image Stabilizer and Intelligent ISO Control accurate. With the help of the Venus IV engine noise is reduced in night or low-light conditions even in ISO 1600 sensitivities. ISO sensitivity ranges from ISO 80 to ISO 1600. Some features of the Lumix DMC-TS10 include the Sonic Speed AF. This feature automatically focuses moving subjects continuously to achieve sharper images especially when taking sport scenes. The Intelligent Auto Mode automatically selects the settings given the conditions and allows excellent quality images every time. Intelligent Scene Selector automatically selects the scene from one of the preset scenes depending on the prevailing conditions; this feature eliminates the need to change certain settings. For clearer, sharper and crisper pictures the Panasonic Lumix DMC-TS10 employes the MEGA O.I.S. that compensates the movements of the camera due to handshake thereby reduce blurring in every shot. Intelligent ISO detects the subject’s movement and the camera compensates by choosing the right ISO sensitivity and shutter speeds preventing motion blur. The Panasonic Lumix DMC-TS10 comes with a built-in flash suitable for low-light situations. The flash is also able to correct the red-eye effect. Reviewing and framing shots are easily done using the 2.7-inch TFT Screen color LCD display containing 230,000 pixels. The LCD screen has an Anti-Reflective coating that minimizes glare especially under the bright sun. The power source of the Lumix DMC-TS10 is from an ID-Security 3.7V 695mAH Lithium-ion battery pack and lasts approximately 300 shots. The DMC-TS10 has a built-in memory of 40 MB but additional external memory cards can be bought to expand memory. Images are saved on to the memory card with a maximum resolution of 4320 x 3240 in JPEG format. High definition videos are also recorded at resolutions of 1280 x 720 at 30 frames per second. Like other rugged outdoor cameras the Panasonic Lumix DMC-TS10’s reinforced body is heavy allowing it to absorb falls and be able to hold out water. For an outdoor camera, the 35 mm wide-angle lens will not be enough to capture breathtaking wide-angled shots. The DMC-TS10 has poor light sensitivity and shooting in low-light conditions, with a maximum ISO setting at ISO 1600, can be challenge. The Panasonic Lumix DMC-TS10 standard accessories includes the Lithium-ion rechargeable battery pack and appropriate battery charger, battery case, silicon jacket, A/V cable for TV connection, USB cable for a computer connection, hand strap and CD-ROM which includes photo editing software, drivers and utilities for the DMC-TS10.